Hot, stimulating Cayenne peppers are like a jump start to a cold car engine on a frosty morning. It brings welcome life into sore muscles and get your heart beating faster, increasing the flow of blood all through the body. The heat of cayenne warms stiff arthritic joints and relaxes away low back pain. The longer you use it, the better it works. Cayenne works very well for me, I use it every day, sometimes twice a day, for arthritis stiffness, sore muscles, and low back pain. Cayenne infused oil does not burn my skin as much as capsaicin creams. Cayenne salves and oils are my first recommendation to anyone who has problems with pain, however cayenne has many other varied uses that make it one of the most powerful remedies in your kitchen medicine cabinet. Cayenne for Pain relief Cayenne pepper extracts are an important part of herbal treatment for muscle pain, fibromyalgia, arthritis, and the nerve pain caused by shingles and sciatica.101 It appears to act by decreasing the concentration of substance P, the primary chemical used by nerve cells to transmit pain signals. It takes repeated use over a period of at least a few weeks to feel this benefit. Cayenne is also rich in salicylates, natural aspirin like compounds, which add to its analgesic nature. 102 Cayenne pepper balms, oils and creams are rubefacients,which means it warms the body by quickly dilating small capillaries, and increasing circulation, which reddens, (but does not burn) the skin. This increased circulation is the hallmark of cayenne's effect on the body, it stimulates the heart, and the lungs as well as increasing blood circulation and warmth throughout the whole system. Cayenne Pepper Diet: Adding cayenne to your diet plan is a no-brainer. Cayenne, along with other peppers strengthen digestion and lessen the change of bacterial infections from unsanitary food and water. 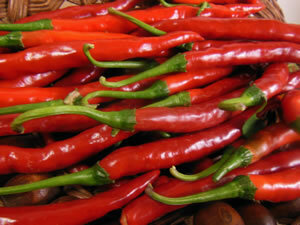 Cayenne peppers also lessen the gas and bloating that comes from eating heavy, greasy foods. Cayenne helps boost your metabolism and induces the body to burn off more fat. Eating more hot spicy foods will help decrease appetite and increase satiety, so you are inclined to eat less. Seasoning with pepper lessens the need for salt and fat in cooking without sacrificing flavor. Heart Health: Cayenne is considered to be a valuable heart tonic. These hot peppers contain capsicum which has been shown to reduce cholesterol and triglyceride levels. Cayenne also helps to increase circulation and keeps the blood flowing smoothly through veins and arteries. Cayenne also is high in antioxidants, rounding out its cardiovascular benefits. Preparation Methods & Dosage :Cayenne powder is used to make liniments and herbal oils. Cayenne extracts can be taken in capsule and liquid form. Both fresh and dry cayenne peppers are used in cooking. This stimulating spice is rarely used as a single ingredient tea, but is added to herbal blends in small amounts, generally less than 1/8th teaspoon. Sprinkle cayenne powder on cuts, scrapes and abrasions to stop bleeding. Contrary to what you might think, it does not burn. Capsicum extracts are used in OTC analgesic rubs and creams. In the Kitchen: All peppers, including cayenne, are important to digestion, as well as adding flavor to foods. Peppers speed up the metabolism of meats and fats as well. Cayenne Pepper Side Effects: Don't touch your eyes with your hands after you have handled capsaicin cream, or cayenne powder. (wash with milk or vinegar) Use in moderate amounts,excessive use internally can cause stomach upset. Capsaicin may stimulate the bowel and is not generally considered appropriate for people with irritable bowel syndrome or chronic bowel inflammation. Fruit: Scarlet red fruit (peppers), with white seeds.Over 130 species of peppers contain capsaicin, though cayenne is used most often in herbal medicine. Distribution: Native to Central America,popular in Latin and Southwestern American cuisines. Grown as a garden plant in almost all temperate zones. Grown as a garden plant in almost all temperate zones. Over 130 species of peppers contain capsaicin, though cayenne is used most often in herbal medicine. 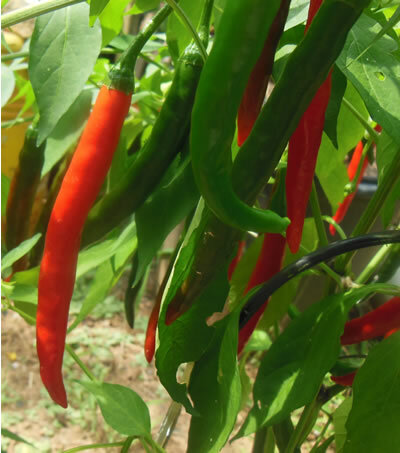 Cayenne plants are very attractive with dark green leaves, and white flowers that are followed by long, scarlet fruits. Cayenne or Capsicum derives its name from the Greek, 'to bite', in allusion to the hot pungent properties of the fruit and seeds. First introduced to Britian from India in 1548 and Gerard mentioned it as being cultivated in his time. It was mentioned by the physician who accompanied Columbus on his second voyage to America.